Who is not in need of inspiration? No matter how strongly one denies, I am sure everyone has experienced that one moment when he/she has admired and/or learnt a lesson from another human being. Today when the current generation of women are breaking glass ceiling in all the spheres of life, be it education, corporate or sports, it is inevitable to take a peak into the lives of women who have broken the patriarchal molds and are leading the charge from the front. ‘She Walks She Leads’ by Gunjan Jain is one such mine of real-life stories which give wings to one’s thought and strength to achieve higher goals. The collection features twenty-four successful women of India who have beaten every odd to reach the top position in their chosen field. The book includes the mini-biographies of Nita Ambani, Rajashree Birla, Sudha Murty, Yasmeen Premji, Parmeshwar Godrej, Indra Nooyi, Chanda Kochhar, Arnavaz Aga, Naina Lal Kidwai, Kiran Mazumdar Shaw, Zia Mody, Swati Piramal, Priyanka Chopra, Mira Nair, Shabana Azmi, Kareena Kapoor, Anamika Khanna, Ritu Kumar, Jyotsna Darda, Shobhana Bhartia, Indu Jain, Mary Kom, Sania Mirza and Saina Nehwal. Though in India we are mostly aware of the profession and causes these eminent personalities are associated with, but the book gives an up-close view of personal struggle and growth of these women from the start. I am particularly inspired by the lives and achievements of Kiran Mazumdar Shaw, Mary Kom and Priyanka Chopra. The author has divided the book to encompass diverse fields; from social responsibility, corporate, media to entertainment, sports, and fashion. She has also taken care to cover personalities in terms of age, region and background. The book is structured to give a peak into the lives of the celebrities and then goes on to a detailed interview by either the family member or closest friend or associate. I liked the fact that the narration sticks to facts and views of the inner coterie, and nowhere it gets preachy or dogmatic. The author at the beginning has summarized the success values that are common during the course of meeting these legends and writing the book, thereby easing the readers into the book. The language is simple yet sophisticated making the book an engaging and fascinating read. The book is further embellished with colored photographs and thoughts of more than hundred people associated with these super achievers. 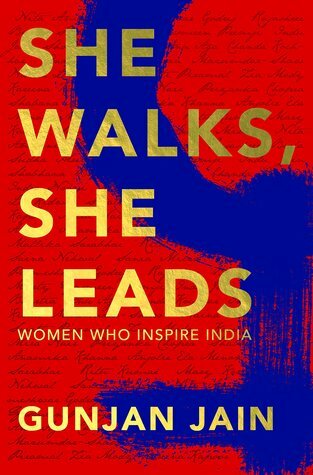 ‘She Walks She Leads’ is a comprehensive, well researched book to add to one’s collection, to be referred time and again and get inspired by women-power of our country. Disclaimer: The book was provided by the author’s publicist. The views and opinions stated in the review are solely mine.